j Inptil power (riot Indeed In mode!) ' Figure B.4. Generic fusion rocket geometry (from [Santarius and Logan, 1998]). A certain fraction of this power must be used for auxiliary systems. If the efficiency for auxiliary power generation is vaux, such a fraction is given by Paux/vaux = FPel, with F being the re-circulating power fraction. Figure B.5. 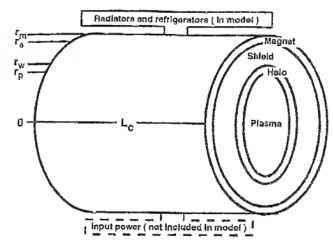 Idealized power flow in a fusion rocket. 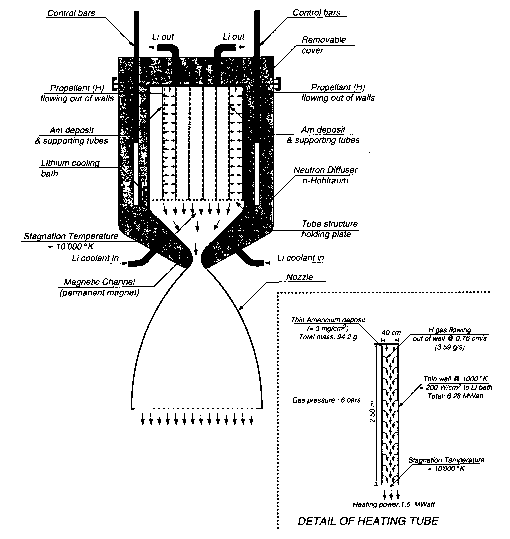 If the reactor is self-sustaining (Paux = 0) then the re-circulating fraction vanishes. In practice this does not even occur for Paux = 0, since part of the electric power must feed the control system, the cryogenic system, and so on. Assuming the realistic value F = 20% and 50% for both efficiencies, values of Q in the range Q = 20-30 are necessary for efficient energy production.